Choose from either a single Taylor Hammer or a Tuning Fork combination! 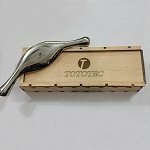 Baseline Percussion Taylor Hammers and Tuning Forks can be found in doctors' offices, clinics, and hospitals all around the world. These sensory tools are used to elicit neurological responses during medical examination in order to detect any possible abnormalities in the central or peripheral nervous systems. The Taylor reflex hammer is the most well-recognized of its kind in the USA, consisting of a triangular rubber component attached to a flat metallic handle. 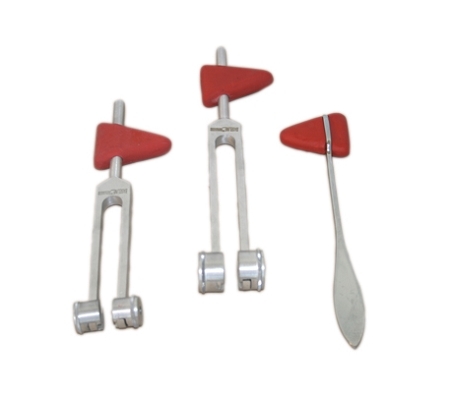 For greater versatility and convenience, there is also the option for a combination Taylor hammer with either a 128 cps tuning fork or 256 cps tuning fork, commonly used to evaluate possible hearing impairment, nerve sensory loss, or proprioception.